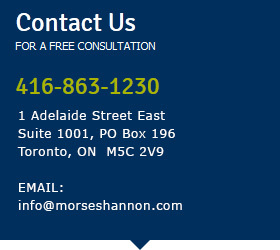 Morse|Shannon LLP is a specialty law firm of expert trial lawyers practicing civil litigation. 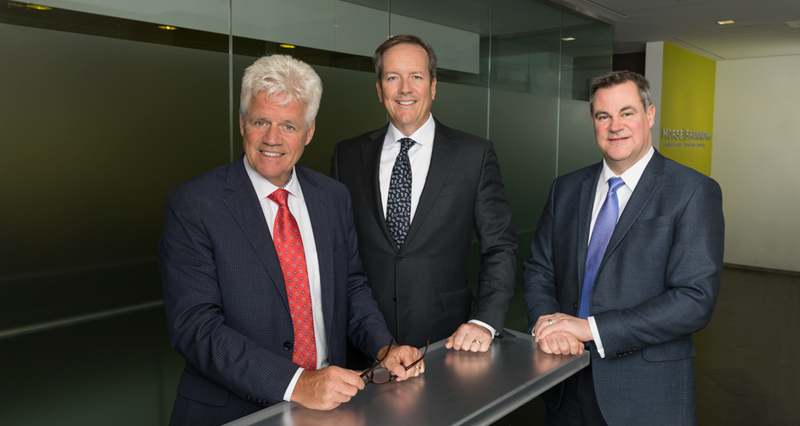 The firm is led by Jerome Morse and Michael Shannon, rated by the two most highly regarded lawyer rating services, Lexpert® and The Best Lawyers® in Canada, as two of the country's foremost trial counsel in their practice areas. Jerome is a Fellow of the American College of Trial Lawyers and both he and Michael are certified by the Law Society of Upper Canada as specialists in the area of civil litigation. On September 27, 2016, Judgment was granted against the City of Sudbury in favour of the Belanger family for $12 million for damages and $1.4 million in legal costs (payable in addition to supplementary accident benefits of $2.4 million). In January 2014, Jerome Morse was retained by the Belanger family's law firm in Sudbury, to conduct the trial for the Plaintiffs which commenced on November 18, 2014, was interrupted, resumed and concluded on April 22, 2015. On November 17, 2015, the trial judge, Sr. Regional Justice R.D. Gordon, delivered Reasons for Judgment that found the City of Sudbury to be 100% liable for the Plaintiffs' damages owing to its failure to keep the roadway properly maintained and free of snow and ice. Lisa Belanger, who was operating her vehicle, crossed the centre line due to the hazardous condition of the road and sustained catastrophic injuries after colliding with a school bus. The City of Sudbury, appealed the Judgment. In May 2017, the Plaintiffs successfully responded to the City of Sudbury's appeal of the award for damages and costs, which, with post-judgment interest, entitled the Plaintiffs to $13.925 million in damages, interest and costs as a result of the successful trial and appeal. The City of Sudbury's appeal was argued on May 10, 2017 before Justices Cronk, Pepall and Chief Justice Strathy. Justice Cronk released the Court's reasons on May 25, 2017, finding that the trial judge reasonably found that the City of Sudbury failed to meet its own maintenance and road standards, which resulted in snow packed and slippery road conditions, resulting in the motor vehicle accident. Paul Pape and Shantona Chaudhry of Pape Barristers argued this successful aspect of the appeal on behalf of the Plaintiffs. Justice Cronk further agreed with Justice Gordon attributing 100% of the fault for the accident to the City of Sudbury. Jerome Morse argued this successful aspect of the appeal such that there was no finding of contributory negligence on the part of Lisa Belanger. On June 28, 2017, the Court of Appeal fixed the Plaintiffs' costs of the appeal at $95,000.00. As a result, the Plaintiffs' total recovery from the City of Sudbury and the Plaintiffs' accident benefits insurer is $16.33 million. Congratulations to Michael Shannon for his 2017 Distinguished™ Rating from Martindale-Hubbell® Peer Review Ratings™. This impressive honour is only bestowed upon the finest attorneys by their peers. Michael is consistently recommended as one of the leading practitioners in the area of personal injury law. On May 26, 2016, Michael Shannon spoke in Toronto at the Ontario Trial Lawyers Association’s (OTLA) Spring Conference on Maximizing Damages in Fatal Accident Claims. The two day event focused on the topic of “From Ordinary to Epic: Crossing the critical gap between competence and mastery”. Morse|Shannon LLP is proud to announce that Jerome Morse and Michael Shannon have once again been recognized in the 2016 Edition of Best Lawyers in Canada. Mr. Morse in the practice areas of Medical Negligence, Personal Injury Litigation and Product Liability Law and Mr. Shannon in the practice area of Personal Injury Litigation. Inclusion in Best Lawyers is based upon an extensive and rigorous peer-review survey comprising more than 175,000 evaluations by top lawyers. For the last decade, Best Lawyers has been regarded – by both the profession and the public- as the most credible definitive guide to legal excellence in Canada. The Lexpert December 2015 Guide to Leading US/Canada Cross Border Litigation Lawyers in Canada has once again recognized Mr. Morse in the practice area of product liability law based upon its annual survey of leading lawyers. Morse|Shannon LLP is proud to announce that Jerome Morse has once again been recognized in the Globe and Mail December 2015 issue of Report on Business magazine as one of “Canada’s leading 2015 Litigation Lawyers” in the Lexpert Special Edition presenting Lexpert ranked lawyers selected on the basis of peer surveys in several business-facing practice areas. The current Canadian Legal Lexpert Directory, a survey of leading senior lawyers and other professionals familiar with the provision of such legal services, has rated Jerome the highest rating available as 1 of 3 lawyers rated “ Most Frequently Recommended” for Medical Negligence representing plaintiffs and 1 of 8 “Most Frequently Recommended” in Personal Injury representing plaintiffs. He has also been ascribed the next highest rating available rated as “Consistently Recommended” in Litigation-Commercial Insurance and “Repeatedly Recommended” in Litigation –Product Liability and in Litigation -Professional Liability. On November 19, 2014, Michael Shannon will be speaking in Toronto at the Osgoode Professional Development short course The Intensive Short Course Fibromyalgia and Chronic Pain Claims - The Science, The Law, The Strategies. Chronic pain syndrome, in its various forms, has been acknowledged as one of the most difficult and expensive-to-resolve areas in personal injury litigation. This information-packed conference is about the latest on how to successfully litigate and mediate these challenging claims. Morse|Shannon LLP is proud to announce that Michael Shannon has once again been selected by his peers in the Eighth Edition of The Best Lawyers in Canada as a leading practitioner in the practice area of Personal Injury. Best Lawyers® is the oldest and most highly respected peer-review guide to the legal profession worldwide. Michael is also listed as a leading practitioner and “consistently recommended” for Personal Injury representing Plaintiffs in the Canadian Legal LEXPERT® Directory. LEXPERT is the most comprehensive guide that ranks top Canadian legal talent. Morse Shannon LLP is proud to announce that Jerome Morse has been named the Best Lawyers' 2014 Toronto Personal Injury Litigation "Lawyer of the Year" and that on October 13, 2013 the Ontario Trial Lawyers Association ("OTLA") honoured Jerome with the OTLA Bruce T. Hillyer Award awarded to an individual who exemplifies the spirit of OTLA in fearlessly advancing the cause of individual rights by the effective use of trial advocacy. The Canadian Legal Expert Directory ("LEXPERT"), a survey of leading lawyers in Canada, has rated Jerome the highest rating available being 1 of 2 lawyers "most frequently recommended" for medical negligence representing plaintiffs and 1 of 4 lawyers "most frequently recommended" for personal injury representing plaintiffs. He has also been ascribed the next highest rating available being "consistently recommended" in litigation, commercial insurance and litigation, product liability. Jerome is rated "repeatedly recommended" for professional liability cases by LEXPERT. On January 29, 2014, Michael Shannon is a Co-Chair at the OTLA Medical Malpractice Conference “Medical Malpractice: Building Your Case Through to a Jury Trial” being held in Toronto. Jerome Morse is a speaker at this conference “The Medical Malpractice Discovery: Nuts and Bolts”. Both Michael and Jerome are also participating in a Discovery Demonstration and Panel Discussion at the conference. On December 10, 2013, Jerome Morse will be providing a demonstration of a plaintiff’s mediation opening statement for The Osgoode Short Course in Mediation Advocacy, part of the Osgoode CLE program. Jerome Morse is the 2013 recipient of the H. Bruce T. Hillyer Award. This award is given to an individual who exemplifies the spirit of OTLA in fearlessly advancing the cause of individual rights by the effective use of trial advocacy. Michael Shannon was a keynote speaker at the Ontario Trial Lawyers Association (OTLA) 2013 Fall Conference, speaking on Examining Lay Witnesses and also carried out a demonstration. Jerome Morse and Michael Shannon have once again been selected by their peers for inclusion in the Eighth Edition of The Best Lawyers in Canada as leading legal practitioner in their practice areas. Jerome Morse was selected in the practice areas of: Medical Negligence, Personal Injury Litigation and Product Liability Law. He was also named the Best Lawyers' 2014 Toronto Personal Injury Litigation "Lawyer of the Year". Michael Shannon was selected as The Best Lawyers in Canada 2014 in the practice area of Personal Injury Litigation. Two children were passengers in a car and suffered catastrophic injuries as a result of a head on collision. Both children suffered spinal cord injuries. Shortly before trial, the insurers and their lawyers of the various defendants settled for over $11,000,000 - one of the largest settlements in Canadian history at the time. An elderly pedestrian in excess of 70 years old was standing on a sidewalk with his wife when he was struck by a car. The car had been rear ended by a truck that was following too closely. Our client suffered a catastrophic brain injury and required 24-hour attendant care. The case proceeded to trial so that our client could access the insurance policies of both vehicles. Notwithstanding that the truck was following too closely, we were able to convince a jury that the driver of the car was 20% at fault for making a last second decision to turn right, without any prior warning. Entire contents © Morse|Shannon LLP, all rights reserved.